What caused riots in the Albany area? What was going on in the 1920s that made riot insurance a possible coverage? 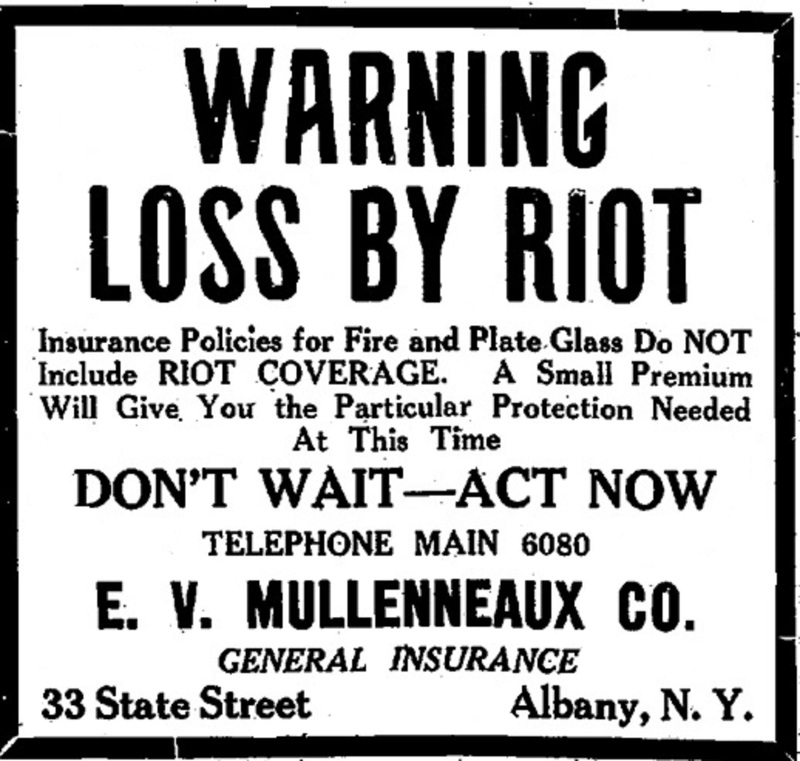 Following, we follow an advertisement, from 1921, urging people to get riot coverage. The question still remains, why? Many things were going on in the United States during this time which could have caused aggravation. First off, there was lots going on in the United States in politics. Woodrow Wilson was completing his term as president, leading to a new presidential election. In addition, the 18th Amendment had just gone into effect in 1920, making the sale and usage of alcohol illegal through Prohibition (U.S. Const. am 18). Another factor may have been this issue of race. From 1910 to 1930, the Second Grete Migration of blacks to Albany was happening. Then, in 1921 Tulsa Race Riot happened in Tulsa, Oklahoma. According to the Tulsa Historical Society and Museum, a black man and white woman were in an elevator together in Tulsa, leading to his arrest. The Tulsa Tribune issued a report which spurred a riot (Tulsa Historical Society and Museum, 2016). After the riot ended, about 300 were dead, 800 were injured, and 35 city blocks were destroyed. One could only imagine that this led to a feeling of national fear, leading to people wanting riot insurance. In fact, according to Lawrence Gooley of the New York State Blog, the Klu Klux Klan was recruiting in New York during the 1920s. It states that, sadly, there were about 11,000 members of the KKK in the Albany area during this time (Gooley, 2014). Of course, this could also lead to fear of riots in Albany. However, one of the largest factors to the need for riot insurance during this time was probably the issue of labor strikes. According to James Crosaro and Kathleen Roe (edited for the internet by Dr. Gerald Zahavi and Susan McCormic), labor riots were extremely prominent in the areas around Troy. Around 1873, labor unions were significant enough to become a large part of the Troy area. The Street Railway Employees of Troy (and Albany) had several violent protests during the early 1900’s. One of these strikes happened in 1921, the same year this riot insurance advertisement was produced (Crosaro, Roe, 2015). “33 State Street,” Albany Walks for Health, accessed April 20, 2019, http://www.albanywalksforhealth.com/items/show/156. “1921 Tulsa Race Riot.” Tulsa Historical Society & Museum, 2016. http://tulsahistory.org/learn/online-exhibits/the-tulsa-race-riot/. Gooley, 2014. “1920s KKK Recruiting Efforts in Northern New York.” The New York History Blog, June 11, 2014. http://newyorkhistoryblog.org/2014/06/11/1920s-kkk-recruiting-efforts-in-northern-new-york/. Corsaro, James, and Kathleen Roe. “Labor and Industry in Troy and Cohoes: A Brief History.” Translated by Gerald Zahavi and Susan McCormick, December 2015. http://www.albany.edu/history/Troy-Cohoes/.